Elaine Pagels has 1 media appearance. Pickford Film Center & Village Books present "Writers in the Limelight." Join us for the screening of lectures and presentations from some of the most celebrated voices in the humanities, arts, and sciences. Watch author Elaine Pagels discuss her book Revelations: Visions, Prophecy, and Politics in the Book of Revelation in this special movie showing at the Pickford Limelight Cinema. (Author is not attending this event). We will have a Village Books hosted discussion after the showing. In her startling and timely book, Pagels returns The Book of Revelation to its historical origin, written as its author John of Patmos took aim at the Roman Empire after what is now known as "the Jewish War," in 66 CE. Militant Jews in Jerusalem, fired with religious fervor, waged an all-out war against Rome's occupation of Judea and their defeat resulted in the desecration of Jerusalem and its Great Temple. Pagels persuasively interprets Revelation as a scathing attack on the decadence of Rome. Soon after, however, a new sect known as "Christians" seized on John's text as a weapon against heresy and infidels of all kinds-Jews, even Christians who dissented from their increasingly rigid doctrines and hierarchies. This on-screen author talk will be showing at the Pickford Film Center's Limelight Cinema. Tickets are available through the Pickford Film Center. Village Books will provide books for sale at the event. The Interfaith Action of Austin Book Club meets the second Monday of every month at 7PM on BookPeople's third floor. This month they are discussing The Gnostic Gospels by Elaine Pagels. Members of any and every faith are welcome to attend. Pagels returns The Book of Revelation to its historical origin, written as its author John of Patmos took aim at the Roman Empire after what is now known as "the Jewish War," in 66 CE. Militant Jews in Jerusalem, fired with religious fervor, waged an all-out war against Rome's occupation of Judea and their defeat resulted in the desecration of Jerusalem and its Great Temple. Pagels persuasively interprets Revelation as a scathing attack on the decadence of Rome. Soon after, however, a new sect known as "Christians" seized on John's text as a weapon against heresy and infidels of all kinds-Jews, even Christians who dissented from their increasingly rigid doctrines and hierarchies. In a time when global religious violence surges, Revelations explores how often those in power throughout history have sought to force "God's enemies" to submit or be killed. 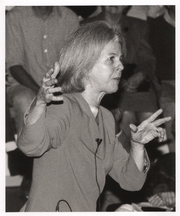 Elaine Pagels is the Harrington Spear Paine Professor of Religion at Princeton University and the author of Reading Judas, The Gnostic Gospels-winner of the National Book Critics Circle Award and the National Book Award- and the New York Times bestseller Beyond Belief. In her bestselling Reading Judas and The Gnostic Gospels, Pagels, Princeton professor of religion, made ancient texts vital by illuminating their history. Here she considers the Book of Revelation in light of events in the year 66 C.E., which included John of Patmos’s response to the Roman occupation of Jerusalem. Revelations: Visions, Prophecy, and Politics in the Book of Revelation Elaine Pagels Elaine Pagels exploded the myth of the early Christian Church as a unified movement in her 1979 book The Gnostic Gospels, which won both the National Book Critics Circle Award and the National Book Award, and was chosen by the Modern Library as one of the 100 best books of the 20th century. Known for her work in translating the Nag Hammadi Library, she joined the Princeton faculty in 1982, shortly after receiving a MacArthur Fellowship. Her other books include The Origin of Satan; New York Times bestseller, Beyond Belief; and Reading Judas. In Revelations, Pagels examines the historical origin of the New Testament Book of Revelation and the roots of dissent and violence in the world’s religions. Parkway Central Library 1901 Vine Street Philadelphia, PA 19103 (between 19th and 20th Streets on the Parkway) This is a TICKETED event; $15 General Admission, $7 Students. For more information, please call 215-567-4341, or click here Tickets on sale January 12, 2012 at 10:00 a.m.
Elaine Pagels signs Beyond Belief: The Secret Gospel of Thomas. Elaine Pagels is currently considered a "single author." If one or more works are by a distinct, homonymous authors, go ahead and split the author. Elaine Pagels is composed of 15 names. You can examine and separate out names.